The 1970 season started badly for Rindt when he crashed at the Spanish GP after the rear aerofoil collapsed, putting him into hospital. During practice for Monza 1970 ‘something broke’ on the car, which veered at enormous speed into the barrier. The front of the Lotus was totally destroyed and Rindt was pronounced dead on arrival at hospital in Milan. 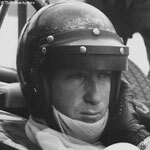 Rindt became the sport’s first and to date only posthumous World Champion. In 2009 the Salzburg Rallye Club payed homage to former Formula 1 world champion Jochen Rindt with the opening of an opera dedicated to the late Austrian driver.